I think we all want to live the American dream. We want a big house, a yard for our kids and our dogs to run in, and a project that will be the envy of the neighborhood. Well, Wayne Martin had a house and a yard, and decided to get to work on a large-scale project to really set his home apart from the rest. So naturally, he started digging! While the rest of his neighborhood thought he was nuts, they quickly realized he had an amazing plan for his backyard. It’s pretty crazy what Wayne did with this giant hole, but it’s definitely one of the most ambitious projects we’ve ever seen! What Are You Going To Do With That Hole? 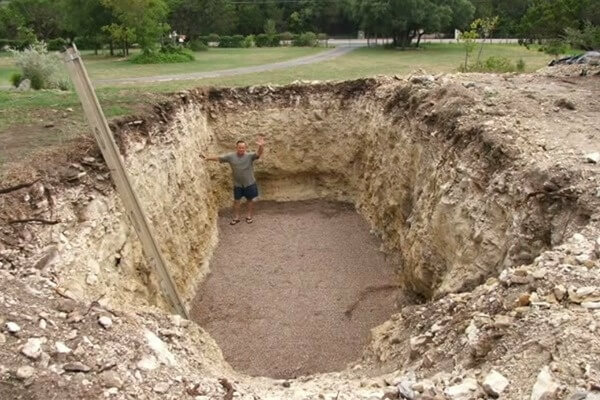 The first thing I would have thought if I came across one of my neighbors digging a hole this size is that they have plans for an in-ground swimming pool. Frankly, even if it was just a giant swimming pool, I think his entire neighborhood would be jealous. However, Wayne decided to fill that hole with something more than water. After laying down some gravel, he brought in something that definitely doesn’t fit in any pool. Neighbors quickly took notice once Wayne brought a 20-foot shipping container onto his lawn.